As the torrent of drivel pours forth, the UK media sets for itself a new low in its reporting of Brexit, presenting as it is doing the prime minister in confrontation with the EU over the supposed negotiations, treating this as if it was a real event. As it stands, the Article 50 negotiations finished on 25 November with the publication of the Withdrawal Agreement, which was subsequently endorsed by the December European Council. Barring a political earthquake of extinction-level proportions, that effectively ended the matter, and marked the start of the ratification process. Time after time since, various EU officials have made it abundantly clear that the negotiations are over and that there will be no renegotiation. On the table is the withdrawal agreement (the political declaration doesn't need ratification) and the necessary consequence of the failure of any of the parties to ratify is that we automatically leave the EU without a deal. There is absolutely no point, therefore, of the media trying to cast this as a battle between a "plucky" Mrs May and a recalcitrant EU which is wickedly refusing to restart the negotiations. The negotiations have ended – what part of "ended" doesn't the media understand? Of course, they are only one part of the nexus of insanity, with the primary driver in this current episode of the ongoing Brexit soap opera is Sir Graham Brady and his fatuous amendment on Tuesday, which induced 317 moronic MPs to vote for the Northern Ireland backstop "to be replaced with alternative arrangements" which, to this date haven't been specified and most likely never will be. One can entirely understand the political imperatives that drove Mrs May to back this amendment. When you are surrounded by idiots, there is a real limit to the things one can do in order to deal with them. That said, there is no excuse at all for the media to go along with the fiction that there are going to be any meaningful (or any) renegotiations. And it is totally absurd for any media organ to project a sense of shock or outrage at the EU's response. After all, when Sabine Weyand recently reminded us that there was "no negotiation between the EU and the UK", she almost apologetically had to add: "I'm not giving you any news here". Latterly, we have an account of how Oliver Robbins, the prime minister's chief Brexit negotiator, warned against backing the Brady amendment, on the basis that the EU would be unwilling to reopen negotiations. If any confirmation was needed, there we have the indications that Mrs May knew full well that her ploy was not going to succeed. There is thus no excuse for the likes of the Mail to wax indignant about the EU response, claiming that Jean-Claude Juncker is playing "hardball" simply because he reminds us that, when we leave the EU, the Irish border becomes the external border to the European Union. This is purely a statement of fact. 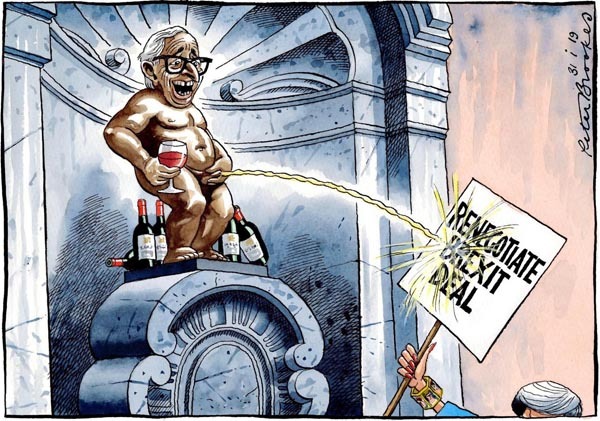 And bluntly, the Brookes cartoon in The Times (pictured) is just playing to the gallery at the lowest possible level. For the rest, there is just blather, with the BBC's Nick Robinson tweeting that the EU and Ireland "seem to be playing hardball in belief that Commons will stop no deal Brexit & a cross party coalition for a customs union would be a better bet than a Tory party deal to ditch the backstop &/or go for a managed no deal". That man seems to have a record-breaking capacity for packing more inanities into a tweet than the inventors of Twitter would have thought humanly possible. At the heart of the media inadequacy, of course, are the two core approaches which dominate political reporting: the obsession with personalities and the insistence on framing stories in an adversarial context. With a scant regard for accuracy, the media is further handicapped by its profound ignorance of how the EU functions, creating an almost perfect storm of irrelevance in its broader coverage of Brexit. Already preordained is the next instalment of the soap opera, set for the days before Valentine's Day when, on 13 February, Mrs May will have returned from Brussels – presumably empty-handed – to lead yet another interminable and unilluminating debate, with a vote the following day. It may be a day early, but some hacks could not resist allusions to a Valentine's Day massacre. Until then, the tedium will continue, with little chance of it abating. But, if Mrs May takes the risk, and resubmits an unchanged Withdrawal Agreement to the House, we can expect this to mark our irrevocable descent towards a no-deal Brexit. More correctly, I suppose it will be a Valentine's Day Eve massacre, the day when all hope of a negotiated departure evaporated. And at that point, the media can then go to town on disaster predictions, vying with each other for the most lurid or outlandish consequences. By the time we actually reach 29 March, the nation will have been driven into such a state of catatonic boredom that television hacks will be reduced to interviewing each other, with their audience numbers not exceeding the number of staff they can pack into their newsrooms. The rest of the nation will be playing Candy Crush or some such, as the more attractive option. Brexit day may pass without anyone noticing. Of course, we could (and most probably will) see attempts at prolonging the agony. There may be a push to reactivate the flagging prospects for another referendum, there may be attempts to delay Brexit (which could succeed, if only because the "colleagues" want more time), and a last stand on revoking the Article 50 notification. Assuming all these endeavours come to nought, we enter a new phase in our history, celebrated by massive traffic jams or perhaps not. For a variety of unpredictable reasons, Brexit day could truly be a non-event. The true damage of a no-deal may take some time to materialise. There is even an outside possibility that Mr Corbyn, with his new-found enthusiasm for talking to his own prime minister, rather than sundry terrorists, may convince parliament to embrace his latest idea of a "comprehensive customs union" – whatever that might be, bringing to life Nick Robinson's speculation. So far, though, exchanges with the prime minister on this have not been productive – although in another sense they have proved to be highly illuminating. We see, for instance, Mrs May challenging the leader of the opposition in the House, demanding to know whether a customs union means accepting the common commercial policy, accepting the common external tariffs, accepting the Union customs code and accepting the EU’s state aid rules. We could take it from this that the prime minister believes that the customs union does involve all that, which is especially interesting. The EU's customs union is defined by Articles 30-32 of the Treaty of the Functioning of the EU, whereas the State Aid provisions are set out in Articles 107-109 – completely different parts of the treaty, with no direct relations between them. Interestingly, the legal base of the State Aid Regulation is Article 109 and, on inspection, it is "EEA Relevant". That makes the rules part of the Single Market acquis, rather than part of the customs union. From the context of his comments, though, and his references to protecting jobs and industries, maintaining living standards, and delivering "frictionless and seamless trade with the European Union", it would seem that Mr Corbyn has more in mind the Single Market than a customs union. From either side of the House, therefore, there is a perilously fragile understanding of the basics of EU treaty law. It is unsurprising that our politicians fare so badly in Brussels. Putting it all to bed is Michel Barnier, who in the European Parliament explicitly accused Mrs May of bad faith, declaring that, even before the votes in the Westminster parliament, "she distanced herself from the agreement she herself negotiated and on which we agreed". "The British government", he said, "subsequently gave the government's explicit support to the amendment made by Sir Graham Brady, which requests that the backstop, which is foreseen in the Protocol on Ireland, is replaced by alternative arrangements, which have never actually been defined". At the same time, he complained, "the House of Commons, rejected the no-deal scenario, without, however, specifying how to avoid such a scenario". Adding his voice to the throng, he stated that, "The backstop is part and parcel of the Withdrawal Agreement and it will not be renegotiated. The December European Council conclusions - which are fully in line with the recent resolutions by the European Parliament - do not leave any room for doubt on this point". And there is no room for doubt on that other matter, about which M. Barnier would be far too polite to comment. The media, in all its forms, is part of the problem.